Static stretching is the most common technique used in hatha yoga. There are two categories of static stretching. The first is active static stretching. This involves contracting antagonist muscles to stretch a target muscle. Contracting the quadriceps, iliopsoas and biceps during the forward bend paschimottanasana is a form of active static stretching of the hamstrings. Contracting antagonist muscles in active static stretching results in a phenomenon called "reciprocalinhibition." During reciprocal inhibition, the central nervous system signals the target muscle to relax. Passive static stretching occurs when we relax into a stretch, using only the force of body weight (or an externally applied weight) to stretch muscles. The restorative pose setubandha is an example of passive static stretching of the iliopsoas muscle. (Scientific Keys, Volume II covers the physiology of stretching in detail). 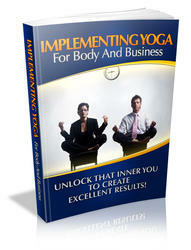 Yoga practitioners use facilitated stretching to deepen their postures. This type of stretching involves contracting the muscle being stretched during an active static stretching. This action triggers a reflex arc involving the Golgi tendon organ, resulting in a profound relaxation of the target muscle when the contraction period ends. This is also known as proprioceptive neuromuscular facilitation (PNF). It is extremely important to consider the joint reaction forces when using facilitated stretches, since the force the muscle generates is transmitted to the joints. As a general rule, gently contract the stretched muscle to avoid excessive joint reaction forces. These images demonstrate facilitated stretching ot the gluteus medius, maximus and tensor fascia lata. Yoga practitioners use dynamic stretching during the vinyasa type practice. This type of stretching involves repetitive movement of the body into increasingly deeper stretches. Performing dynamic stretching in the morning "resets" the resting muscle length for the day. Motion of the musculoskeletal system necessarily involves multiple joints, forces applied in many directions, and movement in many planes. 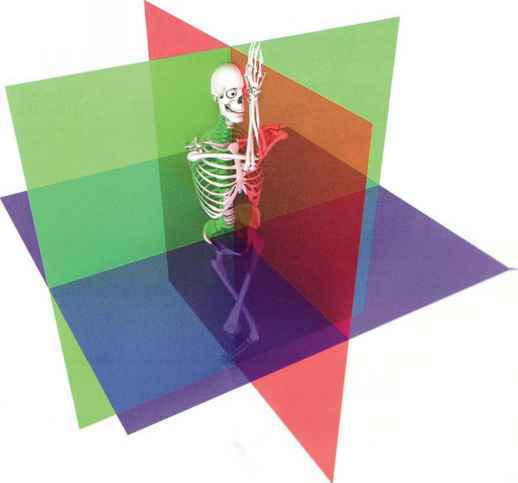 A convention exists to describe the basic movements of the musculoskeletal system that can be useful in analyzing the form and function of the asanas. 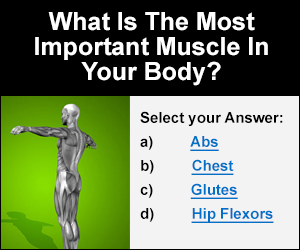 The six basic movements of the body take place in three planes. 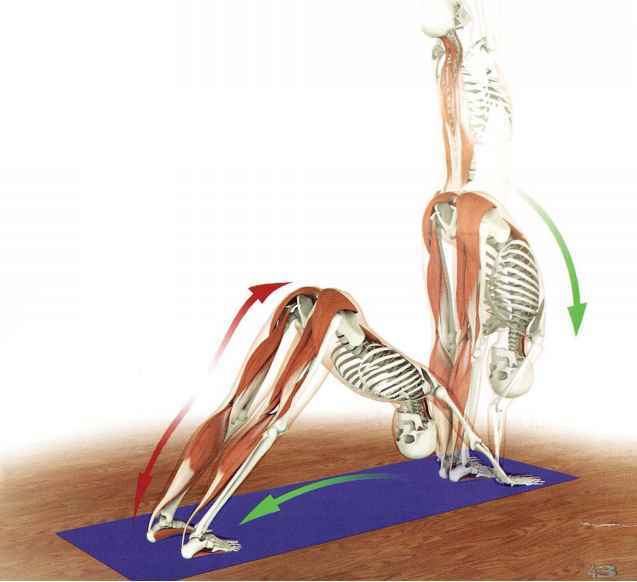 Coronal plane: Divides the body into front and back. Movements along this plane are called adduction and abduction. Adduction moves the extremity towards the midline, abduction moves the extremity away from the midline. Sagittal plane: Divides the body into right and left. Movements along this plane are called flexion and extension. Flexion usually moves the extremity forward except at the knee where it moves backward. Extension moves the extremity backward. Transverse plane: Divides the body into upper and lower halves. Movement along this plane is called rotation. Rotation is further classified as medial rotation (toward the midline) or lateral rotation (away from the midline). Medial and lateral rotation are also referred to as internal and external rotation, respectively. All movements of the body are composed of varying contributions of these six elemental movements. Is yoga static or dynamic stretching? What muscles are being stretched during back extension? How to type divide stretching muscle?